The second edition of the Dutch Bioinformatics & Systems Biology conference will be organised on April 19 & 20 2016, at Congrescentrum De Werelt in Lunteren, the Netherlands. 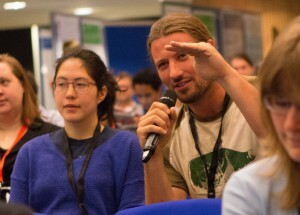 BioSB 2016 discusses the latest developments in bioinformatics, systems and computational biology and interrelated disciplines, and their wide-ranging applications in life sciences & health, agriculture, food & nutrition. BioSB 2016 will again be a 2-day scientific conference (April 19-20, 2016) with keynote speakers, parallel sessions, an evening poster session and a nice evening programme. The conference will offer lots of opportunities to meet with fellow Bioinformatics and Systems Biology colleagues from academia and industry as well as master students. On April 18, the day preceeding the conference, the YoungCB retreat will be organised. As this is the annual conference of BioSB, the national Bioinformatics & Systems Biology research school, BioSB 2016 will offer a programme with a mix of state-of-the-art work in both areas. 2015 December 28 in BioSB 2016. Full programme BioSB 2016 now online! ← Call for Workshops/SIGs & Tutorials ECCB 2016 now open!